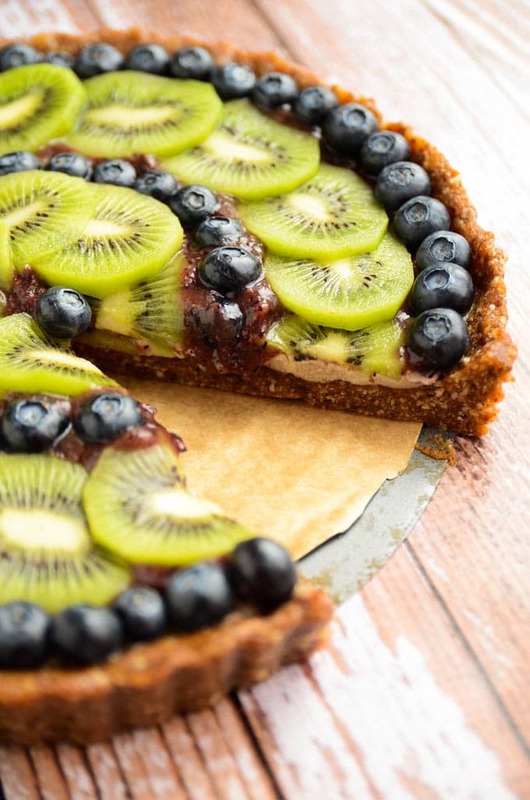 This vegan raw blueberry and kiwi tart is as fun to look at as it is to eat! A simple almond-date crust is filled with a delicious cinnamon-cashew cream and topped with eye-catching concentric circles of fruit. 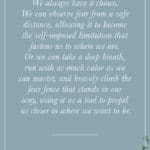 I hope you all had a beautiful weekend! Ours was spent working, blogging, and getting things done around the house, but we made plenty of time to eat this tart. Actually, we made time to enjoy it on four separate occasions. But who’s counting? I’ve concluded that the tart’s target-like design threw us into a deep trance. One slice is never enough, you must eat more tart. You must eat all of the tart. 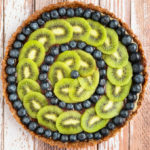 In all seriousness though, this blueberry kiwi tart is incredibly tasty and deserves your attention for not just one but two or three slices. Three’s a charm in life and in tart consumption. This fruit tart is both delectable and packed to its crinkled edges with nutrients and good-for-you ingredients. 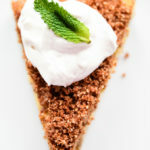 The crust is made from a combination of raw almonds, dates, vanilla bean, cinnamon, and nutmeg, which creates an ultra-gooey, dense, and delicious tart base that elegantly nuzzles each topping layer within its nutty embrace. The crust is then filled with a banana-cashew cream that adds a sweet richness to balance and tame the acidity from the fruits. The next layer is a kiwi-blueberry glaze that gets spread over the banana-cashew cream to add a brightness and a touch of tang. 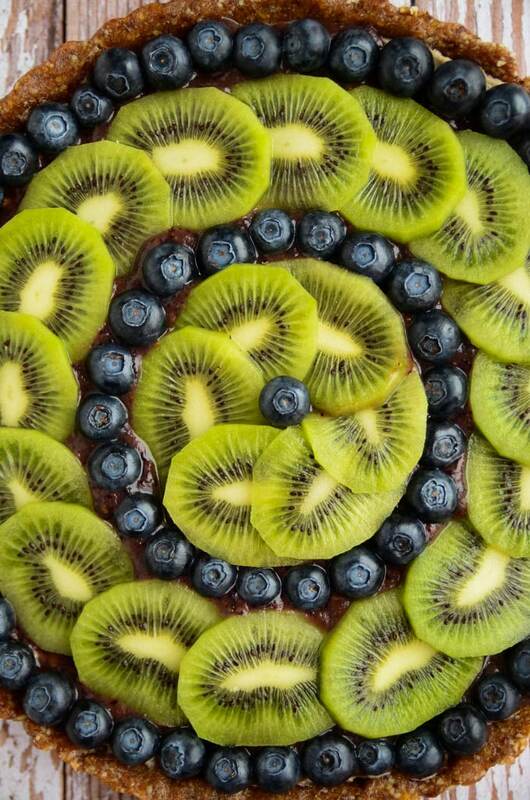 The final layer is a symmetrical arrangement of kiwis and blueberries, which adds eye-appeal and a dash of glam. 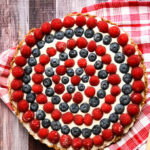 Despite having multiple steps and layers, this tart is surprisingly simple to make, and I promise it will be worth all that methodical berry placement! 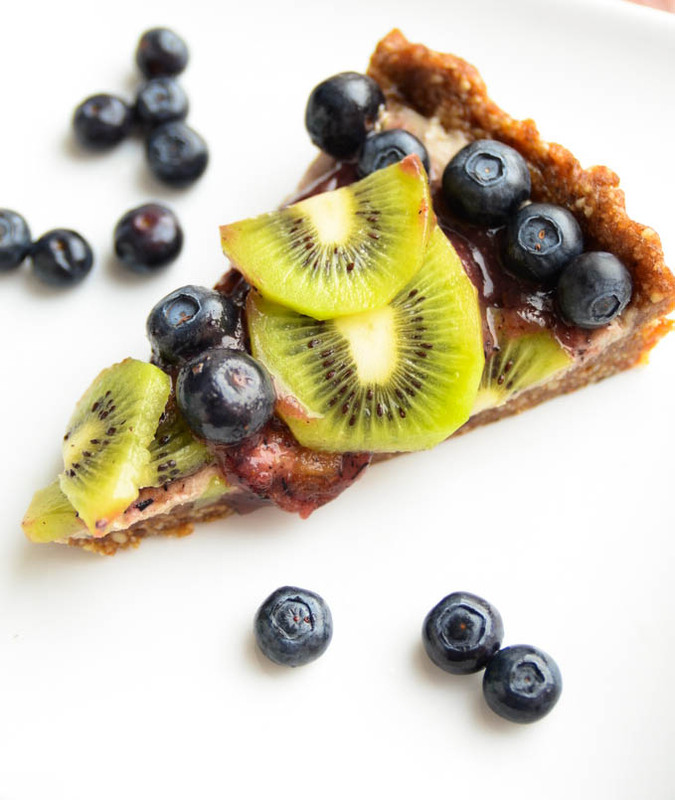 To make this vegan fruit tart, you’ll start by making the crust. Add raw almonds to a food processor along with medjool dates, cinnamon, vanilla bean, and a pinch of nutmeg. Then, process until ground into a sticky meal. Line a round tart pan with parchment paper, and press the crust mixture into the bottom and up the sides. Then, freeze the crust for 30 minutes to set it. While the crust is chilling, prepare the banana-cashew filling. Add soaked raw cashews, banana, dates, cinnamon, and lemon juice to a food processor and process until completely smooth. Pour the cream into the tart shell, and freeze for 10 minutes to set. While that layer sets, prepare the glaze. Add two kiwis, half cup of blueberries, and four dates to a high-speed blender. Blend until a smooth glaze forms. Then, pour the glaze over the cream layer. 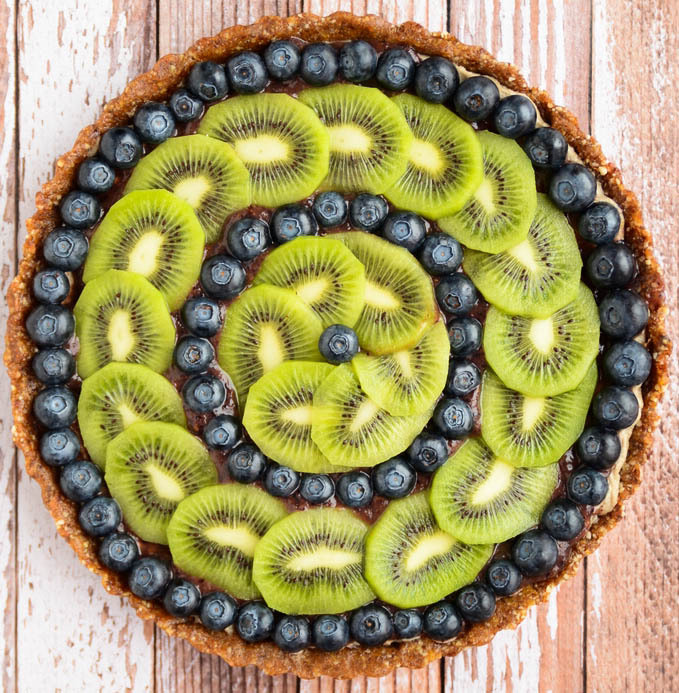 Finally, arrange blueberries and sliced kiwis on the surface of the tart, forming concentric circles. This step takes a bit of time, but really pays off in the end! I like to return the finished tart to the freezer for at least 15 minutes before slicing and serving, but you can serve it straight away in a pinch. Add the cashews, banana, 3 pitted dates, 1/2 teaspoon cinnamon, and 1 tablespoon of lemon juice to the food processor. Process for 5-7 minutes or until completely smooth. While the cashew cream is setting, add 2 kiwis, 1/2 cup of blueberries, and 4 pitted dates to a blender. Blend until a smooth glaze forms (approximately 2 minutes). That is a beautiful dessert…can’t wait to make it! These are stunning photos. Great work!! Thank you for the sweet compliment, Nicole! This is simply gorgeous! Not to mention mouth watering yummy looking. Thanks for posting. Can’t wait to try this. I thought so too, as did others who enjoyed the tart. I would not freeze the tart after initial freeze. Added to much water when brought to room temp, would refrigerate. Wonderful, yummy, healthy desert!! This is so beautiful! I can’t stop staring at all your pictures! I’m guessing that mine won’t look nearly was gorgeous as yours, but I’ll have to give it a try. Such sweet words — thank you so much! I promise it looks trickier than it actually is. If you spend 10 minutes layering the fruit, yours will look the same. Just takes a little time and patience :) I hope you enjoy it! 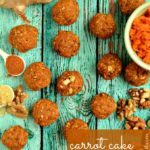 I saw how amazing this looked and couldn’t believe it was made with all raw ingredients. It sounded too good to be true. I decided to try it out and I’m glad I did. It tastes absolutely amazing! It’s a great dessert you don’t have to feel guilty about making. 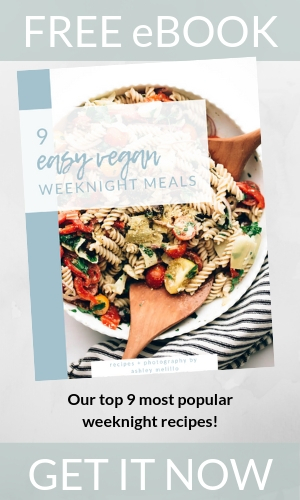 This recipe is definitely becoming a regular in my house. Thanks so much for sharing it! I’m so glad you made AND enjoyed the tart! Thanks so much for commenting, Lizzy! The dates broke my Vitamix as I was making the crust! Argh! What did I do wrong?! Hi Liz, I’m so, so sorry to hear that! Did you pit the dates? If the pits were left in, they could cause a serious problem with your food processor (not to mention really mess up the crust). That’s the only thing I can think of that would cause a problem. The crust should process very easily in a food processor. Just saw a picture of this xake on pinterest and immediately thought I’d have to check what other recipes you do. I’m speechles, they all look super good. What to make that’s green and blue for a Seahawks-themed party tomorrow? Found your tart and it looks gorgeous. Can’t wait to dig in. Go Hawks! Hi, Pat! I hope you enjoyed the tart! Haha, it really is the perfect dessert for a Seahawks-themed party — too funny! My husband has always been a Jets fan but he’s recently developed an affinity for the Seahawks which has made me a fan too. So, go Hawks! 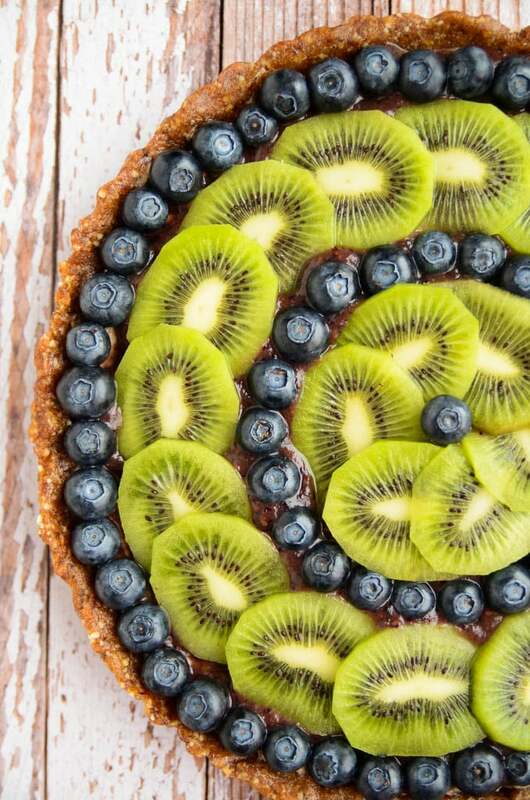 I love this kiwi blueberry tart! I will be making this soon and for Easter! I hate baking, so this is perfect. Where do you find vanilla bean caviar? 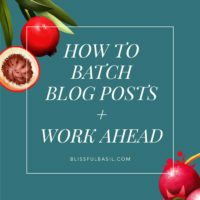 On a side note, Inlove your blog format and recipe set up is is a widget or pulug-in? You photos are lovely too! Hi, Megan! I’m so glad you’re going to give this tart recipe a try! Vanilla bean caviar or seeds are scraped from the inside of a whole vanilla bean. I usually cut the bean lengthwise and use the back of a small paring knife to scrape the beans out of the pod. I hope this helps! I’m glad you like the blog format and photos! Thank you for your sweet words! The recipe setup is a plugin called “Easy Recipe” — there is a free version and a premium version (I believe this one costs $30). The free version is great but the premium version allows you to create subheaders within the ingredients and instructions (e.g., “To Make the Crust”) and include links to other posts/recipes, so I upgraded to that version after a few months of having the free one. There are also several formats you can choose from to customize it, which is so helpful! This looks delicious and reminds me of spring! Wow what a great summer and spring treat! Love the fruit tarts! So refreshing! Thanks, Stacey! I promise that the tedious kiwi and blueberry layering will repay you upon first bite. Enjoy! This is beautiful. Looks delicious! I’m halfway through making this and am having a lot of trouble. My brand new Cuisinart bowl is sized so that the crust ingredients just fling on the side. What make/model/capacity did you make yours in? I had to scrape down the sides of the bowl in excess of 60 times. Very arduous. Then came the nut and banana cream. It also is so thick that it flings away from the blades. I decided to go with the drink/smoothie attachment just so I could get a smaller container in hopes that it would keep more ingredient near the blades. I had to repeatedly take the machine apart to get the ingredients back near the blades. When it finally was smooth and soft enough to stay near the blades, I let it run for about 1 minute and a half but the machine and the ingredients had generated so much heat that the top blew off the Cuisinart and blew the cashew/banana mixture all over my kitchen. I’m 50 years old, a very experienced cook, and have a tremendous track record in the kitchen. 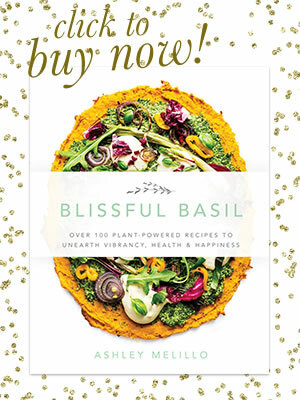 I have a vast cookbook library, a very well-fitted kitchen and followed, adjusted, and created recipes for 35 years. This recipe is the worst disaster I’ve ever had (except for the celsius/fahrenheit conversion mistake I made 7 years ago.) I don’t know how many times you test your recipes before posting and to what degree you field test with friends on various equipment to make sure it works in the “global” kitchen, but I plead with you to do so. It’s such a shame to waste such valuable ingredients as these raw and organic products. Thankfully, I can whip up a batch of homemade ice cream in the time I have left before dinner. I’ll be very, very cautious about trying your creations. I got a very sweet and concerned email from Ashley Melillo. It would seem I have a larger food processor bowl than she, which might account for some of the issue. I can only guess that moisture content in the fruit and nuts might be an issue as I don’t know what consistency I was aiming for. Having my ego tempered by scrubbing nut and banana off my ceiling, I’ll proceed more cautiously when I make this again (I won’t be beaten) and might run things through a food mill, first. Tarts are hands down my favorite sweet! I can’t wait to make these! I want to make this tart a day or two in advance. Should I just store it in the freezer or is it better fresh? Hi, Kaity! It’s definitely best fresh, but you could prepare the crust in advance and then make the rest of the layers the day of serving. I made this tart last night and it was terrific! 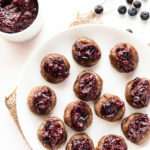 I love that it is made with such healthful ingredients and that I was able to use my kiwi and blueberries from my CSA box to make it that much better! 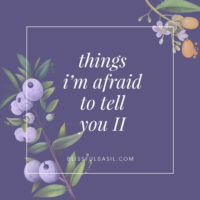 I will be posting about it on my blog and will link back to you. 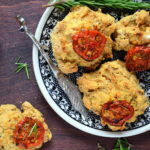 Thanks for sharing the recipe – you inspired me. Made it yesterday. Lots of work. But it turned out it tastes as delicious as it looks beautiful.